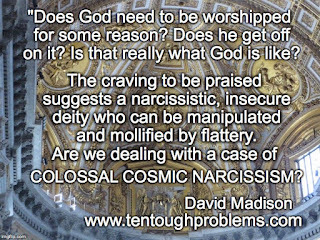 Debunking Christianity: A Case of Colossal Cosmic Narcissism? Why Do People Worship? A Case of Colossal Cosmic Narcissism? Why Do People Worship? The faithful admit it: They are there on Sunday morning to worship God. A friend of mine once defined himself and his status as a believer. “I am a worshipper,” he said. Why would that be important or appropriate? Schools are for learning, offices are for business, stadiums are for sports, hospitals for healing, and we all agree that they answer legitimate human needs (even stadiums). Churches, however, are dedicated to that most baffling of human obsessions: getting together frequently to boost God’s ego. When priests raise funds to build churches they always claim that the real purpose is to glorify God, which can only mean that there is a divine ego that must be stroked. My friend the worshipper had gulped the Kool-Aid. He has bought into this peculiar, warped view that our feelings of wonder and awe must be directed at a Supreme Being who isn’t satisfied unless the awe and wonder are directed at him. The faithful will accuse me of egregiously misunderstanding what’s going on in church; they’re just showing proper respect and humility before The Almighty. But pardon my cynicism. What they’re doing is pouring on the flattery, often with congregational singing. In 2001, How Great Thou Art was ranked the second most popular hymn (behind Amazing Grace). So we can assume that millions of Christians every Sunday lift their voices to assure God that he is great. Isn’t that a curious thing to do? How can it be necessary? God likes to be sung to? Worship, as a human obligation to conjectured higher powers, is a ridiculous position. Does God need to be worshipped for some reason? Does he get off on it? Is that really what God is like? The need to be worshipped, the craving to be praised suggest a narcissistic, insecure deity who can be manipulated and mollified by flattery. 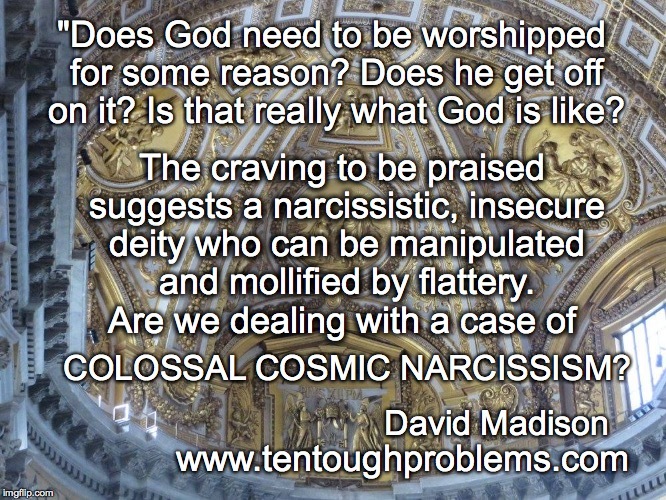 Are we dealing with a case of colossal cosmic narcissism? If there is a god who created the universe, why would this god demand to be loved and worshipped by mere humans? Anyone not under the spell of religion quackery should find this idea astonishingly absurd. David Madison has a PhD in Biblical Studies from Boston University. He was a pastor in the United Methodist Church for nine years. His book, Ten Tough Problems in Christian Thought and Belief: a Minister-Turned-Atheist Shows Why You Should Ditch the Faith, was published by Tellectual Press in August.